'Romancing Mister Bridgerton' is without a doubt, the most splendid addition to the Bridgerton Series. If you have not read at least one of the three books preceding this particular novel, I encourage you to do so. The culmination of what proved to be a most rousing subplot in this series thus far plays out in tremendous fashion as we watch two of the most unforgettable and unlikely characters fall in love. Penelope Featherington is no stranger to ridicule, being brazen gossip-columnist Lady Whistledown's favorite punching bag. Colin Bridgerton, the presumed devil-may-care nomad of the Bridgerton bunch, is home from Cyprus and searching for the direction in life that will lead him to a purpose. The awkward wallflower he thought he left behind in Penelope has blossomed into a vision of unparalleled and slightly disconcerting desire and she harbors a secret that becomes all too intriguing. What will Lady Whistledown have to say about such an absurd and unlikely match? Penelope Featherington knew from the start of her premature first season, that she was destined for the life of a spinster. She was better off than most, with a fiercesom friendship with blue-stocking beauty, Eloise Bridgerton, and her unrequited love for Eloise's brother, Colin. Penelope has been in love with Colin since two days before her sixteenth birthday. The incident in the park which stole her breath away has stayed with her throughout the long and lonely years, but it is in the year 1824 that Penelope's luck starts to change. Colin has been blessed with a good lot in life. A wonderful family, filled to the brim with mischievous younger siblings and reliable and trusted elders, a wonderful and sometimes misguided mother who dotes on him with unconditional love, free time a plenty and hearty family coffers; what more could he want? He knows how fortunate he is in this world, but Colin can't shake off the biting resentment for those around him with something to live for. He travels the world, charms the ladies at every port, but still has yet to find his purpose in life. His older brothers are both successful in their own right; one being an accomplished artist and the other living up to his duties as Viscount Bridgerton. Even his sister Daphne is filling in the role of Duchess supremely. Colin is just looking for his calling. Home from his trip to Cyprus with notebooks full of his accounts of his travels, Colin can't help but cave in to pressures from his mother to attend some social affairs. Things are in a way familiar, but also changed. When next he claps eyes on his sisters friend, Penelope, he isn't prepared for what he sees. She's really grown into herself, and since when had she developed such a quick wit and that maddening cheekiness? Colin knows that the feelings he's developing for Penelope are wrong, but that doesn't help him get to sleep any easier at night. A friendship and a bond begin to form between Colin and Penelope, but soon the inevitable takes place. The two share a spectacular kiss (which knocked my socks off and had me squealing like a pig at breakfast time) and Colin reacts like all the other heros in history always have; by combating and trying to resist what he feels is so right. All the while, Penelope's secret is dangerously coming close to being revealed, and once Colin figures it out, it shocks him to the core. An unlikely marriage, a man's purpose realized, extortion and stolen identity all have a part to play in this stellar Romancing of Mister Bridgerton. My Favorite Part of the Book: Is so hard to choose! At first I want to say that the part that most endeared itself to me was when Penelope asks Colin to kiss her(and he does so). It was truly a memorable moment! But having been a huge fan of the whole Lady Whistledown subplot, I'd have to say that my favorite part in the book would have to be when Lady Whistledown's identity is revealed. Not necessarily the exact scene it is made known to the reader, but rather, the scene when it is revealed at a huge assemblage proceeding a declaration of love. Such a marvelous scene. This is usually the part in the review where I wrap-up my final thoughts on the book. But truly, there isn't much I can say to do it justice. This is a shining example of great writing that compels the reader to feel with the characters and champion the underdog. Just....just...READ IT! 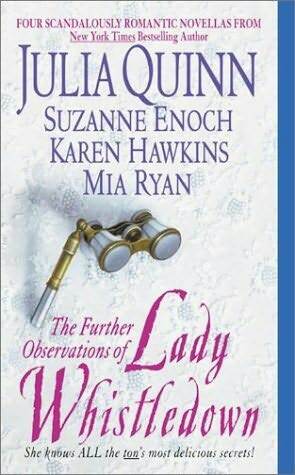 *Also give 'The Further Observations of Lady Whistledown' a try. Acquaint your self with the bold gossip-columnist who keeps all of London on it's toes. This is an anthology with some stellar contributors! Definitely a winner! I think that's the next Bridgerton book I need to read. I read all them before this! You know, her writing voice just delighted me! 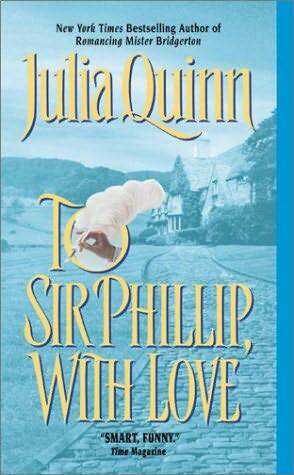 I would chuckle through each of these books with the lively humor of Julia Quinn's Bridgertons. I do want to go back to these and finish the series before I start others of hers. You're posts have been so encouraging to me to pull out some of my favorite authors to read! 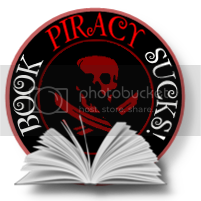 I had to put away Elizabeth Hoyt's THE SERPENT PRINCE to read 3 others that I needed to and just started it again today and its great. Then up is Julianne MacLean's SURRENDER TO A SCOUNDREL, which I think is last but I know if next for me in the American Heiress series that I chatted about before! Your reviews rock! What a splendid reader I have in you, Caffey! Your comments made me smile and I always appreciate what the people have to say about this lil (not so old) blog! I must tell you how thoroughly besotted I am with this series. You absolutely must finish it! I am currently on the tail end of the last book (I held off reading it because it wasn't at the library and I was a scrooge about purchasing; but the Series Spotlight of the Bridgertons this month has bullied me into finishing up) and let me tell you how sad I am to see it end. 'Romancing Mister Bridgerton' is probably the most beloved in the series by the fans, so DEFINITELY get to it! JQ's writing voice and dialogue skills are sublime. You should also try Victoria Alexander, if witty banter is your drug of choice. I have a few reviews for her on here, 'The Virgins Secret' being my favorite book by her so far. Sad to say I haven't read anything by Hoyt, but that will be rectified soon. Probably get to her in July; I'll try to find The Serpent Prince and give it a go! And that Julianne MacLean book was last week's Recommendation of the Week. I really liked it! There was a somewhat serene quality to her writing that just did something for me. Looking forward to reading more by her!